Although we no longer receive child oblates, this chapter is not without interest for us. The rite by which a boy becomes an oblate — literally, an offering made over to God — is akin to the profession of a monk. Once it is certain that the boy’s parents have renounced all claim over him, and will not seek to entice him out of the cloister back into the world by offering him an inheritance, the boy is led to the altar of the Oratory of the monastery. There, the boy’s little hand is wrapped in the altar linen, the ample corporal upon which rest the oblata of bread and wine set apart for the Holy Sacrifice. The child, together with the offerings of the Mass, is made over to God in an irrevocable manner. 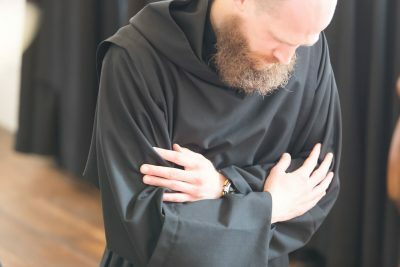 This rite is extremely important, not only for Oblates of all times and ages, but also for monks, because its casts a theological light over the mystic significance of monastic profession. As I explained yesterday, when a man “makes himself over to God” by monastic profession, he is identifying himself with the offering of bread and wine that will become, as the Roman Canon puts it, the hostia pura, hostia sancta, hostia immaculata, the pure victim, the holy victim, the spotless victim who offers Himself in sacrifice to the Father. 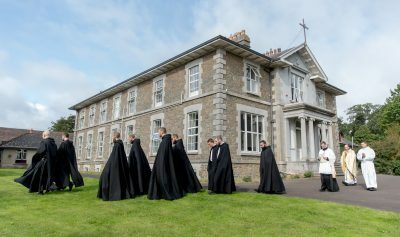 Mother Mectilde de Bar’s emphasis on the monastic life as a state of victimhood is not, as some have contended, a marginal development in 17th century piety; it is, rather, deeply rooted in Saint Benedict’s own Eucharistic understanding of monastic profession. This, in fact, is what is meant by actual participation in the Holy Sacrifice of the Mass. One who seeks to live in a state of oblation, that is, of victimhood, at every moment, will begin to understand that nothing in his life is foreign to the altar. Have I, by the grace of Christ, resisted a temptation? Have I overcome a selfish impulse? Have I kept silence when I could have spoken useless words? Have I offered the alms of a smile to a brother? Have I restrained my curiosity, curbed my irascibility, or quieted turbulent thoughts? All of these things must be brought to the altar. Everything becomes fuel for the holocaust, even one’s sins. Bring to the Holy Sacrifice of the Mass, bring to the Sacred Host hidden in the tabernacle or exposed in the monstrance all of the things, great and small, that have come into your life, lodged themselves in your memory, or left their impression in your imagination. Posuisti iniquitates nostras in conspectu tuo; sæculum nostrum in illuminatione vultus tui. Christ repairs all that we bring to him. When we appear before the Most Holy Sacrament, Christ sees in us the imprints or impressions of all who have touched our lives, affected us for good or for ill, over time or fleetingly. In the same way, He sees in us all whom we have touched, or affected for good or for ill, over time or fleetingly. No one who has touched us and no one whom we have touched is hidden from the gaze of Christ. By bringing ourselves and our history to the altar, we submit to the work of Christ the Reparator and become co–repairers with Him. How many lives have been repaired because one man went to the altar to make himself over to Christ together with all the persons and events that have left an impression, a kind of finger print, on his soul?